USDCHF is consolidating between narrow range in past two trading days. The pair hits high of 1.00982 for the day and shown a minor decline. It has formed almost a triple top near 1.0100 level. The pair has jumped more than 350 pips in past one month on improving market risk sentiment. It is currently trading around 1.00854. 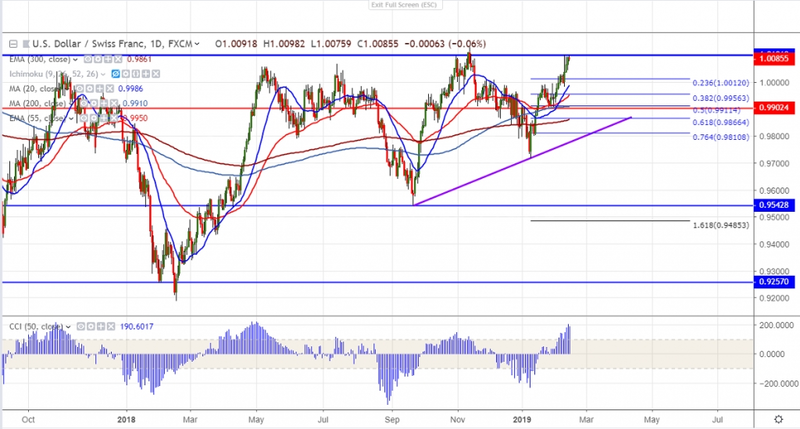 The near term support is around 1.00430 (5- day MA) and any break below targets 1.0010 (10- day MA)/0.9979 (20- day MA)/0.9950 (38.2% fib). The major intraday resistance is around 1.0100 and any violation above targets 1.01285 (Nov 13th 2018). Any convincing break above 1.0130 confirms bullish continuation and a jump till 1.0170/1.0340 likely. It is good to sell on rallies around 1.0100 with SL around 1.01350 for the TP of 1.0010.